Caramut is a small rural township on the Hamilton Highway in western Victoria, 22 km south-east of Penshurst and 48 km north of Warrnambool. It is thought that the name derived from an Aboriginal word meaning ‘markings’, although an undated local history by L.P. Duff states that the word referred to ‘plenty of possums’. The Caramut area was first settled for pastoral purposes by John Muston in 1839. The township is west of the junction of the Muston and Burchett Creeks. A school was opened in the 1850s, and a Common School was opened in 1861. Duff records a hotel being opened in 1848-50, and the Caramut Inn is recorded as being licensed in 1855. An Anglican church was opened in 1866. The Muston Creek bridge was built in 1859. 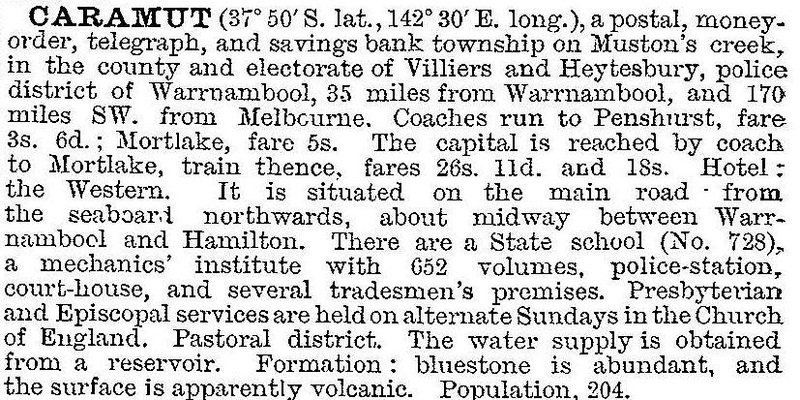 Bailliere’s Victorian gazetteer (1865) described Caramut as undulating, richly grassed and lightly timbered. During the first decade of the 1900s the subdivision of large pastoral properties brought additional population. Two more churches were opened. A polo club was later established. After World War II soldier settlement farms were taken up. The racecourse has since ceased to be used for racing, but a golf course has been laid out south of the town. Caramut has a public hall, a recreation reserve, Anglican and Catholic churches, a general store and a hotel. The primary school closed in 2004 or 2005. A weekly community newsletter is published. At the 2011 census, farming accounted for 60% of employment.